Blurring boundaries between architecture and art installation. The Blur Building, the renowned temporary structure designed by Diller + Scofidio in 2002 as a centerpiece pavilion of the sixth Swiss national exhibition, is here showed in its main peculiar aspect: an immaterial, changing object ready to swallow all who want to test a trick for the senses. The structure, more similar to a tensegrity sculpture than a real building, used fog as its main material. An absent architecture was produced, visitors were challenged to enter and enjoy a sensorial experience while wandering into the fog. 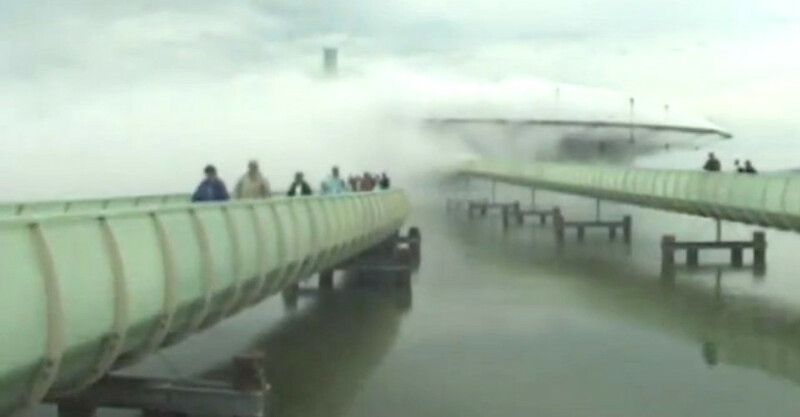 This short live-footage portrays the exterior view of the pavilion where two main features are fused: the smart technology, which responded to the outside weather conditions and transformed the lake water into fog, and Diller + Scofidio's interest in working on the boundary between architecture and art.